This will be my sixth election since 2004. I first got elected in the 2009 local election and subsequently held my seat very comfortably in 2014. I got 2500 first preference votes in the general election five years ago. "We should be reversing the cuts that have been inflicted on ordinary people. Spending on public services should be increased. This would be paid for by a tax on wealth, enforcement of a minimum effective rate of 12.5% of corporation tax and a Financial Transactions Tax"
"The rich should pay their fair share of tax. We would end tax exile status for Irish billionaires and introduce a progressive tax system where people pay based on what they earn. We want a third income tax rate for those who earn over €100,000 and to reduce the USC for those earning under €70,000"
"Water is a human right. People should not have to pay a double tax for water services. The provision of water and the water system should be funded through central taxation"
"People Before Profit have urged people to fight the hated, unjust and unfair tax on water. We fully support the boycott of water charges and will be participating in future protests against water charges and Irish Water"
"People Before Profit are for a woman’s right to choose. We will present legislation to abolish the maximum 14 year prison sentence for people who procure abortions. We believe that women have the right to control their own bodies." "We support a woman’s right to make her own decisions regarding reproduction, including the right to free, safe, and legal abortion. We must Repeal the 8th Amendment because it equates the life of a woman to that of an unborn foetus. It means that women are second class citizens in this country"
"We need a living wage of €11.50 an hour. We should also remove the current loopholes in the minimum wage legislation that allows employers to pay less during a ‘training’ period"
"People Before Profit will ban zero-hours contracts that exploit workers. We will insist on registered employment agreements that pay people premium overtime rates and premium rates for anti-social hours." 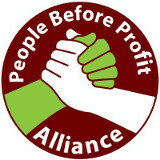 "People Before Profit favors a banded system of rent controls whereby all rental property is assigned to particular bands based on transparent criteria such as location, amenities, size of property. Rents should then be linked to the Consumer Price Index"
"The Local Property Tax take no account of ability to pay. It is based on ‘market value’ which means that the tax on a smaller house in Dublin will be higher than a mansion in Mayo. Moreover, the tax is only levied on the first acre of a property and not the rest"
"The state should engage more with the Travelling Community to develop culturally appropriate accommodation"
"Healthcare should be free at the point of use, regardless of the size of one’s wallet. Britain achieved a free healthcare system after WW2. It is time Ireland caught up. People should not have to pay 3 times – through private insurance, hospital charges & taxes - for the current dysfunctional syste"
"We need to move to a system of publically run creche facilities. It does not make sense to charge the parents of 2 years old for childcare. As an immediate measure the next government must guarantee that parents only pay one third of the cost of childcare"
"Religious groups should have right to use a school as a community facility to hold religious classes after school hours. Religious instruction should not be a central part of the school curriculum"
"Discrimination against school pupils based on religious grounds should be outlawed"
"We are opposed to imperial intervention in Syria which has caused the humanitarian catastrophe. People fleeing bombs and ISIS terror should be welcomed"
"The ECB forced this country to pay off private bondholders’ debt. EU rules have been used to dictate a strategy of privatisation. The EU is hiding behind non-democratic institutions to promote a neo-liberal agenda"
"We favor wind farms that are not run by the profit motive and are not devised for energy export. We need a strategy to reduce energy consumption by a home insulation program and improving public transport. Currently, we are a car dependent society because of an inefficient public transport system"
"Yes, we want to reduce carbon emissions but the current carbon trading model of the EU is not working. We need to move away from a fossil fuel addicted economy. This will only occur in an economy that is geared to the needs of people and not to an incessant drive towards profit"
"People Before Profit does not favor a whip system. We vote seek to establish a consensus in our party through democratic debate and discussion"
"We would go further. The people should be free to recall TD’s that have breached electoral promises"
"It depends on the crime. White collar crimes such as insider trading & corruption should be more severely punished. We need to address the factors behind the rise in crime, such as poverty and unemployment. We need proper training and education for prisoners to help ensure they don’t return to jail"